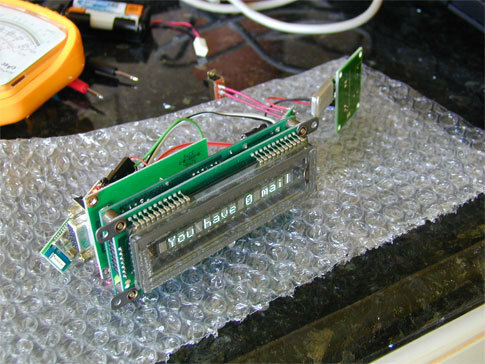 Now you can have your PC stock ticker and take it with you. Or, for that matter, you can schlep your weather report, sports scores, e-mail, PC stats, and RSS feeds around the house or office unencumbered by cables and power cords. Built on the venerable Bluetooth® radio transmitter technology, the “Feeder Reader” gives your PC display a pair of newfound legs. And your text display never looked so good, either. Forget those backlit LCDs, this box uses a vacuum fluorescent display (VFD) that glows a gassy green for lending a trendy retro look to this high tech wireless display. But the “Feeder Reader” isn’t all old school, it’s built on a space age power supply technology—a polymer lithium ion battery. Equipped with an onboard charger system that plugs into your PC USB port for a quick, convenient recharge, you’re ready to take your most important information and move out. You’ll be stepping out in style, too. The “Feeder Reader” is safely ensconced in the perfect finishing touch—a custom-designed old-time radio-style cabinet. Solder the LiPoly battery to the charger. Be sure that you don’t overheat the battery’s solder tabs (do not exceed 350F). The voltage output from the battery is insufficient for powering the Bluetooth modem and the VFD. The voltage must be “amplified” with the 5V DC to DC Step Up board. 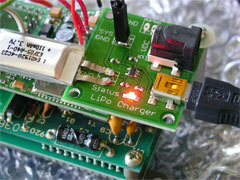 Solder the output from the LiPoly charger to the input of the 5V DC to DC step up PCB. Add an SPST switch to the step up PCB for controlling power ON/OFF. 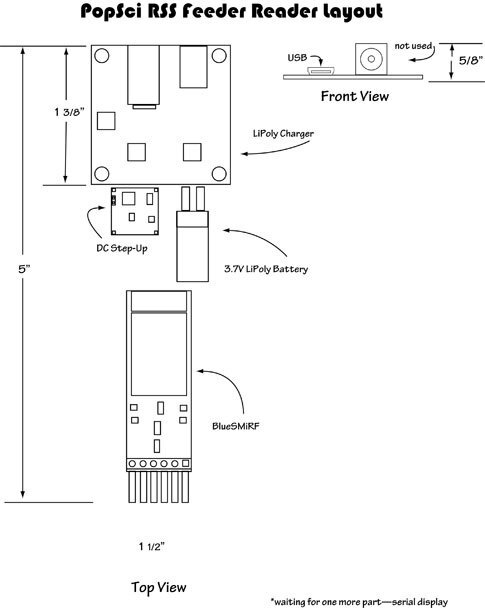 Connect the TTL serial output from the Bluetooth modem to the TTL serial input of the VFD and fit the finished assembly inside your custom case. Use your PC’s Bluetooth software for pairing and connecting to the Bluetooth modem. Set the Bluetooth port for 9600, 8, N, 1 communication parameters. Fire up LCD Smartie. Select the “test driver” display device driver and enter the Bluetooth COM port number and communication parameters. Set the screen size to 1x16 and apply your changes to LCD Smartie (NOTE: you might have to exit this software and restart it for your configuration to work properly). Choose the data that you want to stream to your “Feeder Reader” and take a hike…around the house, yard, or office. Just stay within 50 feet of your PC for ensuring a good solid Bluetooth wireless connection. I wonder if it would be possible to make it work with a 434MHZ RF transmitter, as those are about $50 cheaper. Which would make it a much cheaper project. Also, if you didn't case about being away from an outlet, I think you could skip the battery, charger, and step up circuit to shave $30 more off of it. (Well replace it with a 5V barrel connector and a 5V wall wart.) So down to about $45. Now that would be a great project. Is there anything similar to LCD Smartie that runs on Linux? Check this web site for LINUX driver/software. I have been thinking about something like this for years, as I can remember hooking up a led bar to a printer port a long time ago to see cpu load on an old linux box. Fun project, might have to give it a go. 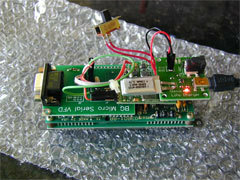 Yes you can make this with the 434mhz RF transmitter and receiver. Check out the LCDSmarite forums for more projects and information. The whole 'solder the battery in place' thing? Don't do it. Use some sense. I know it costs a couple pennies more, but get a proper battery connector. Somebody please build the thing with all the comments given and tell me how it comes out. My dad would probably help me build it if it was cheaper. The instructions to build the information box is quite confusing. Can someone please post step by step instructions with clear pictures as to what is soldered to what. I cant make sense out of these instructions. I have all the parts. Need help please. Also what battery connectors is X7JAY7X talking about. 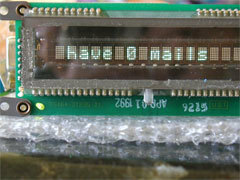 Can I use an LCD display instead of the VFD? If so, can someone recommend a suitable one? 1- Is it possible to manage a matrix of displays from the Same PC? 2- Is it possible to have bottons on the Display Device that would trigger some actions on the PC?